Greenwich’s newest pasta campaign is all about giving more. If you’ve already tried the brand’s very own Spaghetti Supreme, you’ll know it has been improved by adding more noodles, more spaghetti sauce and a yummy garlic stick (for only P49). So naturally, as endorsers we had to follow suit and give more, more, MORE at the recent press conference. As far as press cons go, this one has to be the most outrageous (and fun) of them all. This was the only time Anne Curtis, Solenn Heussaff and I were challenged to do all sorts of crazy things that ranged from doing yoga poses, to applying makeup on an audience member, to belting out to Adele’s Rolling in the Deep and Whitney Houston’s I Will Always Love You (we all know who this is). It seemed there was no challenge we couldn’t do as we were dared to do one thing after the other. Of course, us being game, we just kept on saying, “more”. Hosts Chico Garcia and Gino Quillamor. On stage with Solenn and the hosts. I loved the set. It felt like we were in a talk show. My first challenge: do yoga poses in front of everyone. Challenge accepted. Concentrating hard on not falling. I really tried my best not to lose my balance. My second challenge: play five rounds of Taboo. Words were flashed on screen and I had to make Solenn and Anne guess them without saying certain related words (also flashed on screen). 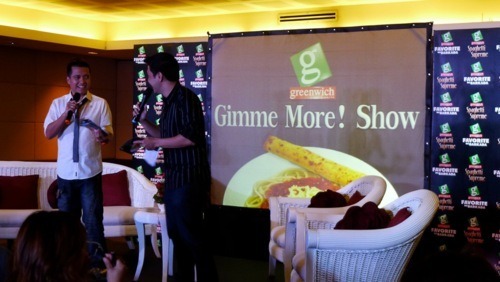 Last part of the program: we had to interview Greenwich Assistant Brand Manager for Pasta, Joanne Ingalla. We took over as hosts. I had the best time, thank you Greenwich!